Congratulations to Roderick “Rocky” Gillis, athletic director at Broward County Public Schools (BCPS), for being recognized as a Certified Athletic Administrator by the National Interscholastic Athletic Administrators Association (NIAAA). He is now one of a very elite group of interscholastic athletic administrators nationwide to attain this level of professionalism. 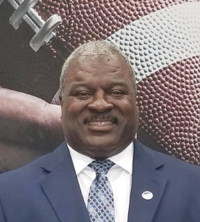 Gillis earned this distinction by demonstrating the highest level of knowledge, expertise and on-going professional development in the field of interscholastic athletic administration. The NIAAA certification process included a thorough evaluation of the candidate’s educational background, experience and professional contributions, as well as a rigorous, comprehensive written examination. The NIAAA is a national professional organization consisting of all 50-state athletic administrator associations and more than 10,000 individual members. It is dedicated to promoting the professional growth of high school athletic administrators and preserving the educational nature of interscholastic athletics and the place of these programs in the secondary school curriculum.